Just getting back from vacation and can finally post some things - whew I never knew how much I LOVED my internet until I didn't have it!!! Anyhow, I made this card for the Stamptacular Sunday Challenge which is anything boy related!!! So I decided to make this card with a free digi from Sliekje. This little boy praying is just too cute and knowing boys - I thought a little computer generated paper saying "please don't let mom find out" was the perfect touch! I have two nephews and from the sounds of it they often don't want mom to find out things! LOL I used my alpha beads again with an elastic band that I could wrap around the card. I popped the image of the boy colored with Copics using my 3D pop dots, I also cut two of the trains out of the Nanna's Stack from DCWV to pop. Finally, I used my cricut to cut out the word bubble from Indie Art - hiding the trouble - and placing in my generated paper. You background and details are so clever and the dimension really makes this such a special card. 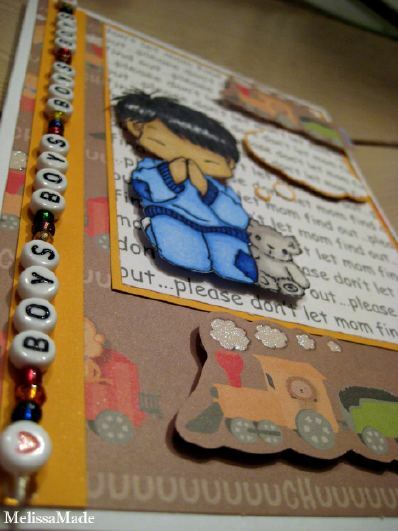 Thanks for sharing this snips n' snails treasure with us over at Stamptacular Sunday Challenge. p.s. I've been back from vacation for a week and I'm still catching up on things! !